My first video for 2017 is finally here and it's quite different to my usual reviews and gaming memories. Don't worry though as I'll still be doing those, infact my next retro review should be for "The Mask" on the SNES if all goes well.This video looks at No Man's Sky and how I feel it was possibly a misunderstood experience due to it's misleading hype leading up to release, how it's less about gathering and crafting, and uses the video game medium more as a vehicle to express how it feels to be an outsider, disconnected from the world, alone. At a time when I neither owned a PlayStation 4 or would consider myself to be a PC gamer, No Man's Sky took me by surprise. I had no understanding of the relevance or importance of the photo tweeted once the project had gone gold, nor had I really got caught up in the hype and mystery, yet once it was released, I felt it... the overwhelming disappointment from millions of people around the world.The Internet was in uproar due to false promises and misleading information from Sean Murray leading up to the launch. The truth behind these actions is unknown, yet I wonder if it was an attempt to bring focus in a method similar to "clickbait" or misleading headlines in magazines and newspapers, in hope that the less sugar-coated subject matter will get the attention it deserves. In terms of sales it performed brilliantly, but in terms of connecting with people it seemed to fail miserably. The misdirection didn't work.Without the high expectations, the hype, and now that the dust has settled, I still wanted to try No Man's Sky for myself. Is it any good? As a game, no, not really, it can be very frustrating and repetitive, but as an experience it had a greater effect on me, something I hadn't really encountered in a video game before.You start off on an unknown planet after your ship has crashed, which you'll need to repair. No backstory is provided, you're just made aware of a few materials you'll need to get back up and running again. Why you're there doesn't matter, nor does how you got there, you just need to reach your destination; the centre of the Galaxy.The urge for me was to find a place to settle down, stay a while, familiarise myself with my surroundings and cautiously explore the landscape. I wanted to stockpile resources for the journey ahead but the game through design, limits you in a way that presses you to move on. Nowhere feels safe, nowhere feels like home, the world around you no matter how serene is killing you with its toxicity or temperature levels. Sometimes slowly, but it's only a matter of time. Your only respite is in your ship or at random bases scattered about the landscape... if you can reach them before your life support runs out.Out in space, whilst free from the hazards that exist on planets, you're still exposed to risk and danger from hostile ships that attack you. Large space stations offer safety whilst you craft, manage inventory space and trade goods, but they're not adequate for long term stays.In these space stations and occasionally in bases you come across on planets, aliens exist to interact with but they don't speak your language, no one does, apart from a few select NPCs to help you along with specific game mechanics, which I'll address later. You never stumble across a being of your own race. In this galaxy you are unique, but from these interactions it's clear you're nothing special. 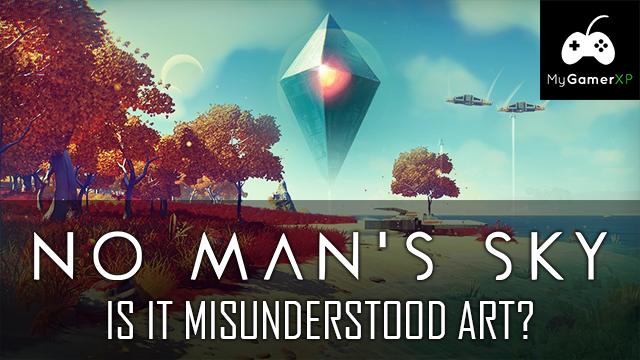 You are just an outsider, tolerated, served, awaiting the next.Unlike many games that try to make you feel like you are part of a world through character dialogue options, No Man's Sky does not. You're not able to form bonds, connections, relationships with anyone, other than to trade. After all you're just passing through, a traveller, what do they care?The feeling I get with this game is similar to a long journey driving on your own, covering a great distance to reach your destination. You stop off at places to buy food or refuel, meeting people along the way, but no deep friendships are formed. You're still alone, you don't belong there, no one really cares, you're just passing through.In other ways this game can be an expression of those going through life feeling like an outsider, like you don't understand people, you don't speak their language. Sometimes you can figure out a few common themes to get by and interact, understanding or unlocking key words and phrases, but you struggle to connect and build deep meaningful relationships. Surrounded by people you still feel alone.This is my experience of No Man's Sky; a forever lasting journey of self discovery from the perspective of someone disconnected from the world, existing within it and compatible only at a level just good enough to survive, "getting by" on a basic understanding of interaction, not to exchange thoughts, feelings, opinions or ideas. Someone lost, alone, confused by their surroundings and looking for answers, a way to understand their purpose.Theoretically there's others like you out there in the Universe, but the online aspect doesn't allow two players to meet and interact. The idea is teased, both through vague promises and the odd log entries from abandoned stations that talk of removing their suits and being subject to infection and death, possibly reflecting the idea that those who feel disconnected often wonder if there others are out there who feel the same and creating fear of "taking off your armour", exposing the real you to the harsh environment, causing anxiety of the possible negative consequences, how it may do more harm than good.This bleak emotional simulation may be too unsettling for some. Never in a game have I ever felt so utterly alone and so insignificant before. If this was intended I can understand why possibly the methods of previewing and drawing attention to the game leading up to release were so misleading. It would be hard to sell something like this. However, this is just my opinion. I believe No Man's Sky may have been a creative expression of how it feels to be like this, a confused lonely outsider existing in the universe, feeling so out of place in a world that belongs to "No Man"... or woman. After all, games can be art and art is in the eye of the beholder.At this point I would like to just highlight that I am aware of the most recent foundation update and how it provides base building, which is essentially a place to call home, but this feels like it was included to quickly please the masses after such a negative initial launch, just a mere distraction, a way to spend or waste resources. The fact that all associated alien NPCs for this part of the game speak your language, without having to find the relevant knowledge stones like everyone else you need to interact with can somewhat break the gameplay style I experienced. It doesn't have a huge impact on it though as it still feels a very lonely and shallow journey. It adds a level of convenience, a way to personalise a certain area on a planet somewhere, but it doesn't detract from the other points I raised in this video and my interpretation of the core experience.For those of you who have also played this game I would love to hear your thoughts in the comments section below. Did No Man's Sky affect you in the same way? Has this video opened your eyes to a potentially new perspective? Or did you feel the same way on your initial play through? I look forward to finding out.As for me that's all for this video, so please like and share if you enjoyed it and subscribe if you'd like to be notified of more from me in the future. Thanks for watching and I'll see you in the next video. So 2017 is finally here and with it comes reflection and a continued ambition to improve from experience and lessons learned in 2016.I'd just like to start off by saying that although a lot of bad things happened in 2016 (both on a global scale and personally), I still have a lot to be thankful for. 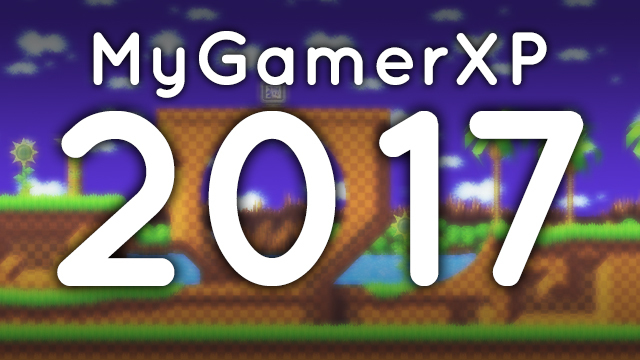 My passion for video games and sharing my opinions/experiences online has introduced me to some wonderful people around the world who's love for gaming has helped me connect with and build numerous friendships.For me, 2016 helped build and solidify a network of supportive, kind and helpful individuals who help me with feedback, ideas, questions, and reaching my goals/ambitions of having the time to embrace my hobbies/interests more and enjoy being creative. I won't name them all here, but the likelihood is if you're reading this, you're one of them. Thank you. To be more organised; so that I can capture footage and edit more regularly, meaning I get to finish more videos for you all this year (I have a lot that are "in progress", that I need to focus on and complete too). To take on one of my more ambitious projects; as fear of me not being "good enough" yet, not having the equipment I need, time and skills required is really holding me back. I need to embrace one and stick to it, no matter what. Make it the best I can now and try not to worry if I can't match my vision. The main thing is to try. To connect more with gamers around the world; this has been something I've really enjoyed and met some amazing people. I mainly focus on twitter, but this year I'm going to try and make more of an effort to post on instagram and other platforms/networks. I'm also thinking of doing twitch again once a week if I can. I've done two streams so far and will see how this goes moving forwards. My plan is to do it in a way I can save and use the footage for my videos/reviews as well. I'm sure I will attend PLAY Expo again too, but I may try to go to 1 or 2 more events this year if possible. There are other goals/tasks I have, such as; "be more ambitious", "upgrade equipment", "try being more relaxed/confident on camera", etc, but these are very dependant on other things, which is why they're not really present here. That said, I will try to be more "myself", more creative, push myself further and try to do my best.